As astonishing debut novel, deservedly garnering critical acclaim and award shortlist nominations, from British playwright Laline Paull, who resides in East Sussex. Flora 717 is born into the lowest ‘kin’ (caste) of her Hive. However her abnormally large size and ability to speak, when the rest of her kin are mute, singles her out for the attention of her Hive’s priestesses. She is permitted to rise through the ranks of the Hive’s hierarchies to become a ‘forager’, even being admitted to serve the exalted Queen, and ultimately becoming both saviour and challenger of her Hive’s fanatically controlled regime. ‘The Bees’ is both a meditation on totalitarian regimes, bringing to mind Margaret Atwood’s ‘The Handmaid’s Tale’ in its portrayal of a female-led society in which only the chosen may breed, and a fascinating insight into the hive mentality and the chemical, pheromone-soaked world of insect society. 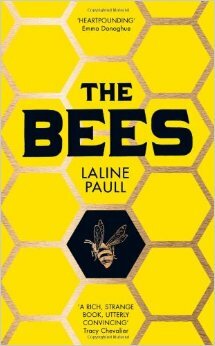 It is quite incredible how lyrically yet precisely Laline Paull renders the essential ‘bee-ness’ of scent-based communication, and immerses the reader so deeply in what is essentially an alien consciousness. A timely subject, given the present peril of our bee populations. Mind-blowingly imaginative, gripping and unique – my first absolute must-read this year!